A few photos that caught my eye during the pre-season, which I am posting now before I forget. 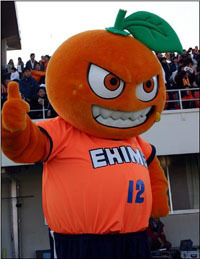 This spunky-looking dude is the Ehime Orange, for Ehime FC -- just promoted to the J2 this year. In Japan, we have an obsession with tying regions with foods -- and in Ehime, the local Orange is their star product by far. This guy has got the 'tude, doesn't he? 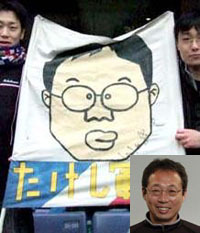 Of course, these signs showing support for specific players, and in this case for the club boss (here, it's Yokoahama F Marinos manager Takeshi Okada), are also part of the supporter scene. And the homemade efforts are I think the sweetest. 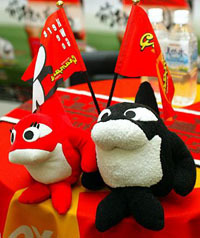 The Daruma tumbler doll shown here is a very common sight in Japanese culture. 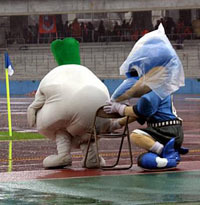 (>>read about Daruma) One eye is painted in black, and the other eye is left unfilled. 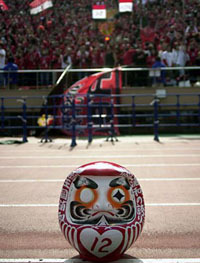 If they win (like this daruma created by Urawa Reds for the Xerox Super Cup last week), the second eye is painted in during celebrations to symbolize the completion/success. Sort of like putting a bottle of champagne on ice in hopeful anticipation of celebration. We also see these used alot in elections.